So for those of us keen to enjoy a little (or a lot) of Game of Thrones or Billions, what’s the best way to go about it? Here we’ll lay out the best options as they stand for some of the premium channels out there, so you can make an informed choice. If you’re into your HBO shows, the good news is there are a whole load of ways to get at them—so which is going to cost you the least? First up you’ve got the cable and satellite packages with HBO included: Spectrum TV will set you back $85 a month (for 12 months) if you want HBO, while DirecTV charges $54 a month (for 12 months), though the first three months cost you just $35. With Comcast Xfinity, you can pay an extra $15 a month for HBO on top of your existing TV package, and those packages start at $60 per month for the first 12 months and $80 per month for the second 12 months on a two-year deal. Now these cable and satellite bundles include a whole host of channels and extras besides HBO (including internet provision), but they don’t exactly scream affordable. Say you want to get HBO just on its own, thanks very much, on top of what you’ve already got set up in the way of TV. Go straight to the source and you can get yourself HBO Now for $15 a month—it comes with apps for Android, iOS, the Apple TV, Android TV, macOS, Windows, the PlayStation 4, and the Xbox One. It’ll run in most web browsers too. You can watch live streams as well as catch up on stuff that’s already aired, so it’s just about the cheapest way to watch HBO and HBO alone if you’ve already got a device that can work with it. If you subscribe to HBO via cable or satellite, you get HBO Go—it’s more or less the same as HBO Now, but is included free with a TV subscription. Finally, you can buy yourself some HBO goodness as an extra on top of an existing over-the-top service, including the new Apple TV Channels—though we don’t know how much that’s going to cost (it’s apparently launching in May). If you spend all your life looking at Apple devices, and the cost of HBO matches what it costs elsewhere, then it might be one of the better options out there. Generally speaking, the price of HBO on other services is the same $15 a month, whether you buy it as an extra for Hulu, or for your Roku device, or for your Amazon Prime Video subscription, or on the PlayStation Vue network. That means your decision then isn’t down to price, but down to the ecosystems and devices you’ve already invested in. And so on to Showtime, which is available in the same sort of ways and at the same sort of prices as HBO. We’ll start with the standalone, no-TV-package option, which is going to cost you $11 a month direct from Showtime. You can watch live, on-demand, or offline without any commercials. The Showtime streaming service works on Android, iOS, Android TV, Apple TV, Amazon Fire TV, Xbox One, some LG and Samsung smart TVs, and anywhere you can access a web browser. There’s no app for the PS4, but you can buy Showtime as an $11-per-month extra for PlayStation Vue (that drops to $9 per month if you’re a PlayStation Plus member). As with HBO, you can buy Showtime as an extra on numerous other cord-cutting services, and the price is the same across the board, with a few exceptions. It’s the same $11-a-month fee on Roku, Amazon Prime Video, DirecTV Now, and Hulu, but at the time of writing, YouTube TV will sell you Showtime as a $7-per-month extra (on top of the $40 per month you’re already paying). Showtime was mentioned during Apple’s presentation of its new Apple TV Channels service—which looks like it’ll be operating along similar lines to the offerings from Roku or Amazon when it appears in May – but as yet we don’t know how much all that is going to cost or what’s going to be included. Keep your eyes open for special offers though: If you’re a student in the US, you can currently get Spotify Premium, and (ad-supported) Hulu, and Showtime, for $5 a month. That’s the best deal of the lot at the moment, but you do need to be a student, and it’s probably not going to last forever. That flat $11-per-month rate you get from most cord-cutting services certainly beats the prices you’re going to pay to satellite and cable providers (though these deals include hundreds of other channels too of course): It’s a $13-a-month add-on on DirecTV, a $12-a-month add-on on Comcast Xfinity, and bundled with the $85-a-month package for Spectrum customers. Not every premium channel has a standalone service like HBO and Showtime do, and you can often pick up a host of other channels as a bundle, whether that’s through cable and satellite (usually more expensive) or a cord-cutting service (usually cheaper). Sling TV has long been one of the better options, and for $15 a month will give you channels like ESPN, AMC, CNN, and the Disney Channel over the web. We’ve already mentioned YouTube TV, and for your $40 a month you get a host of live sports, news, and shows. ESPN, FX, CNN, AMC, and the Disney Channel are all included, alongside dozens of others. What you don’t get with YouTube TV is the option to tack on HBO, even as a paid extra. If you’re prepared to pay a bit extra for a bit more, then packages from PlayStation Vue from $45 a month might appeal, with dozens and dozens of channels available (and HBO and Showtime as optional extras)—remember you don’t need a PS4 to watch, as apps are available for Apple TV, iOS, Android TV, Android and other platforms. Hulu with Live TV, from $45 a month, is another subscription that packs in a lot of channels. These services are about more than just the channels, with extras like DVR functionality and family plans and simultaneous stream limits and supported devices worth looking into. Just because you’re getting the channels you want at the cheapest possible price doesn’t necessarily mean you’re getting the best deal. Amazon Prime Video takes the add-on approach: Pay for the channels you want (including HBO and Showtime). 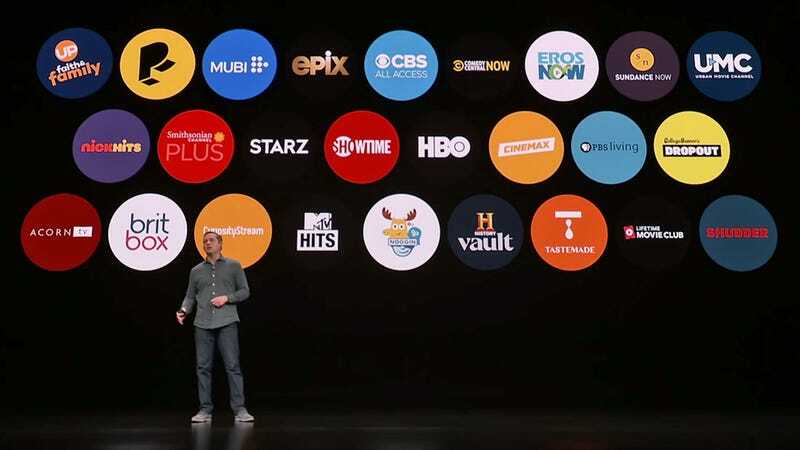 We’ll have to wait and pick through the details of Apple TV Channels when it launches to see just how differently Apple does it—of course, Prime Video needs a Prime subscription in the first place. The good news for TV, movie, and sports fans is that there’s now more choice than ever when it comes to getting content to a device. Netflix is continuing to push its own programs and movies, Apple just showed some of its cards, and Disney is planning to get its own streaming service out before the end of the year. The Dangerous Double Standards Around &apos;Terrorism&apos; in the U.S.